Certain Blackberry features like Hub, password keeper and others which can’t be seen on non-blackberry android devices, will now be available to all Android devices with the marshmallow OS version. 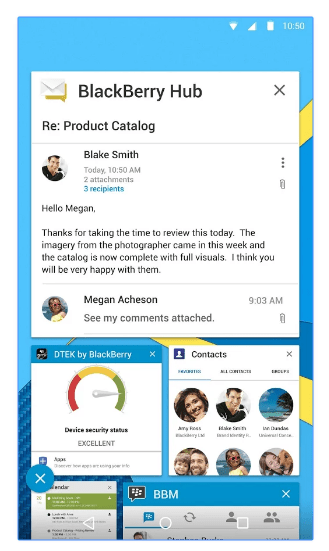 The Blackberry Hub+ which includes the Hub – Blackberry’s popular unified inbox app that view social alert and emails, composes messages, views and responds to calendar invites, and so on, all from one place. 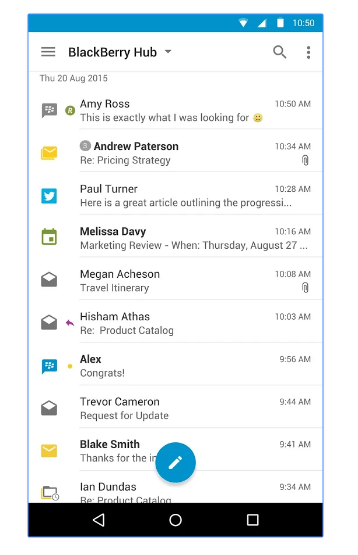 The Hub+ also includes the password keeper; Contacts, Tasks, Device Search universal search bar, Launcher. Contacts – which handles all of your contacts info. Tasks – an app that allows you to create tasks and reminders, with due dates being set. Device Search universal search bar – Notes for keeping track of notes and to-do lists. Launcher – an Android launcher replacement. The Blackberry Hub+ has been made available on Google play for download (only android marshmallow). After the installation, you can download all of the Hub+ services and the apps listed above. It is going to be for free for 30 days. After which users are required to pay $0.99 per month and go ad-free, or continue using them for free and agree to view “occasional” ads. Reports have it, that Blackberry is looking to bring this exclusive app to Android Lollipop devices, and also iOS devices. Blackberry used to make this an exclusive software feature to just its own android make, preloaded on the Blackberry Priv and the soon released DTEK50. But now it’s available to any android device that is running on the android OS version 6.0 marshmallow.